Oh my gawd! It’s here, it’s here!! Today is St. Patrick’s Day!!! 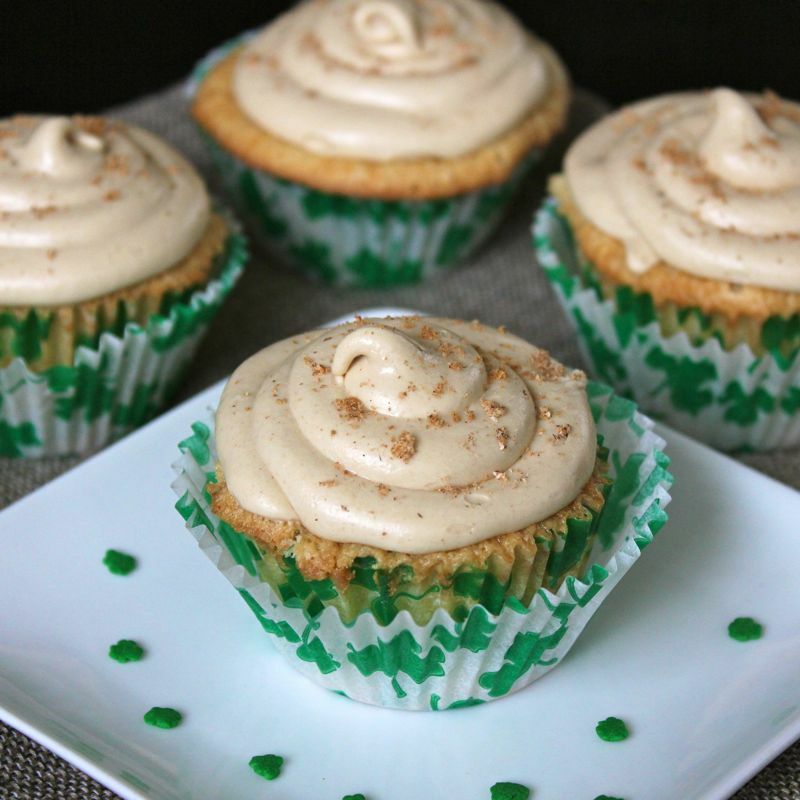 And as per usual, my last post of my St. Patrick’s Day blog-a-thon features cupcakes. And today I’ve got not just any old cupcake…no siree! 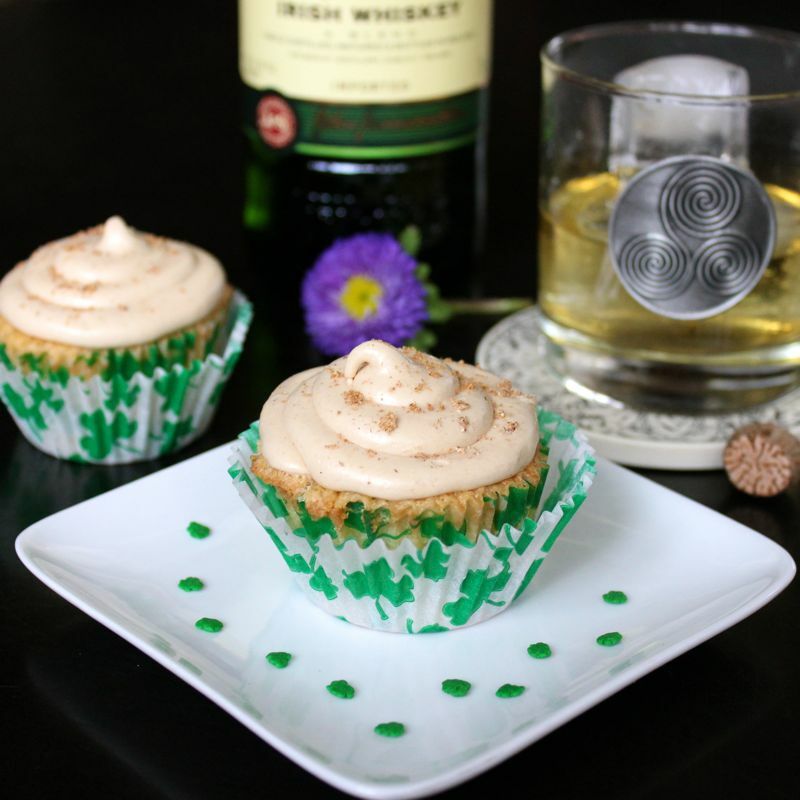 What I’ve got here are Irish Coffee Cupcakes. Can’t get much more St. Patrick’s Day than that! 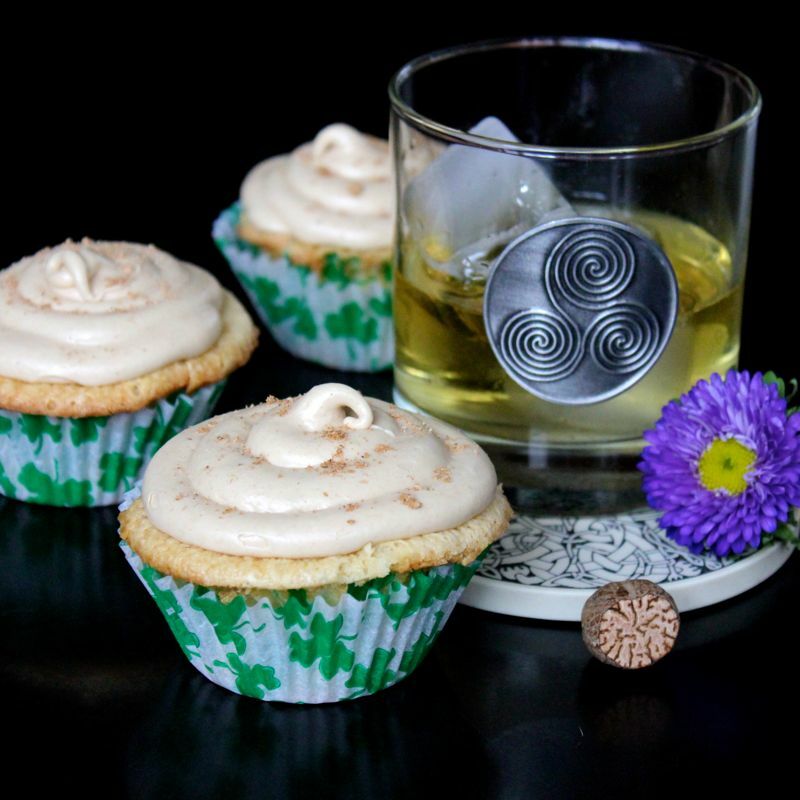 So obviously, I’m giving you that classic Irish cocktail in cupcake form. It is surprising that the Irish Coffee is fairly young when one considers coffee cocktails. It was invented in 1943. Way back in 19th century France, folks were already quaffing “Glorias” which were a mixture of “coffee & strong spirits”. And Viennese Coffee Houses had been serving Pharisäers, sweetened coffee, rum & whipped cream, for quite some time at that point. So fast forward to 1943, Joe Sheridan was the chef at Foynes Port in Limerick when he invented this warming drink and served it to a gaggle of cold and wet tourists. Eventually Stanton Delaplane, an american travel writer, encountered the drink at Shannon airport and brought it back to the US, writing about it extensively. And what do you know, it caught on. Folks loved it then, and still love it now. The classic Irish Coffee consists of hot coffee, Irish Whiskey and sugar and is topped with thick cream which is floated on top of the coffee/whiskey mixture. 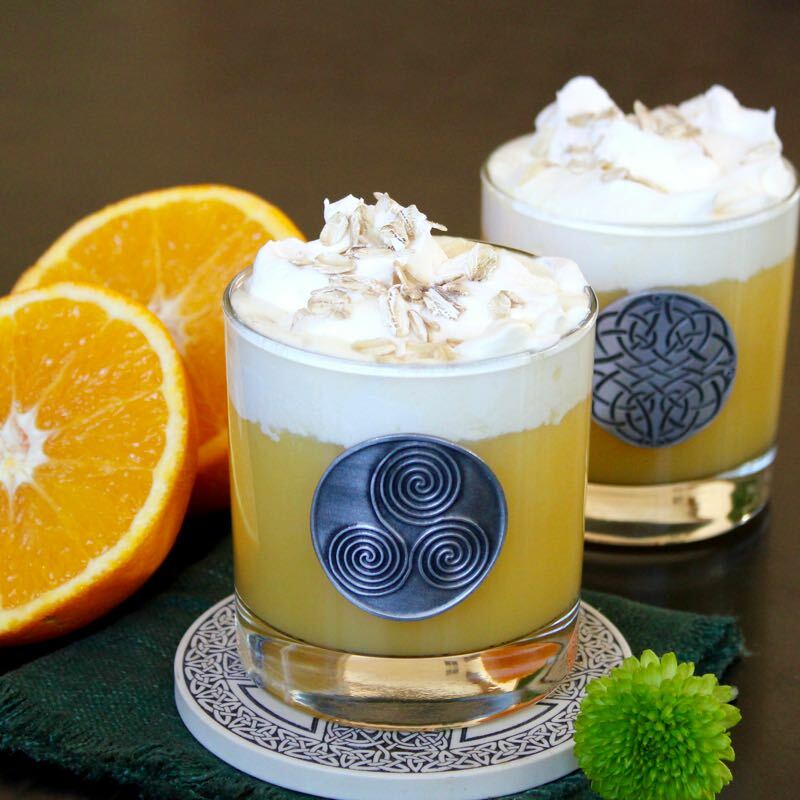 Soothing, warming and utterly decadent, you just can’t go wrong with this elixir. Serve it on a luxurious holiday morning or as a lovely nightcap – perfect every time. And these cupcakes…yeah, they’re worthy of their namesake. Dear Lawd! This is not only perfect on St. Patrick’s Day, but awesome year round. So what are you waiting for, you can have these ready for tonight’s shindig in two shakes of a lambs tail. Now me, I’ve gotta get going…my blogging is done for a while. I’ve got some Patrick’s Day festivities to attend to. So see you in a week or so, Lá Fhéile Pádraig Sona Daiobh (Happy St. Patrick’s Day)! Line 2 cupcake tins with liners. In a large saucepan heat Guinness, coffee and butter together until it comes to a gentle simmer. Add cocoa powder while whisking continuously to avoid lumps. Mix until smooth. Place in refrigerator to cool. In the bowl of a stand mixer, combine eggs vanilla and sour cream. Once the Guinness/cocoa mixture has cooled, add it to the egg/sour cream mixture. Mix until combined. Add the flour mixture in 3 parts, mixing on low speed until just combined. Heat heavy cream until just shy of boiling. Remove from heat and pour over chocolate. Do not mix. Cover with lid and let sit for 5 minutes. Let sit for 10 minutes or so at room temperature. The ganache should thicken a bit. You can pop it into the fridge for a bit to speed this process up. Pour cream and sugar into the bowl of a stand mixer fitted with the whisk attachment. Whisk until Cream forms stiff peaks. Add Irish Whiskey to taste. Once the cupcakes have cooled, cut out the center of each cake with an apple corer, knife or special cupcake corer tool, taking care not to cut all the way through the cake. Place the whiskey ganache into a pastry bag and pipe into the cored cupcake to fill. Spoon the whipped whiskey filling into a pastry bag and frost cupcakes. Dust with espresso powder and top with chocolate covered bean. Cuckoo Luckoo Gourmet Chocolate Covered Espresso Beans – This link is for a 1 pound box of these beans. To be honest, I got mine at my local Starbucks. They sell them in little 1/75 oz snack packs! Boozy Irish Brownie Bites?!! Now we’re talking! These rich, decadent little gems are chock full of Irish Whiskey and frosted with a white chocolate, Baileys and Whiskey Ganache! I’m telling you, there is no way you could go wrong here. And just a warning, these guys are indeed boozy. I took care to add those spirits after the ganache was removed from heat, so there is no “oh the alcohol cooked off” with these darling treats. It is all there. Another thing that is absolutely great about these little guys is their diminutive size. You can literally just grab one and pop the whole thing right into your mouth. You know, just a small bite, a wee taste if you will, just in case you don’t really want to commit to eating a whole big honking brownie. Now, I’m sure that sounds good in theory and I know there are folks out there that have that kind of “I’ll just take a taste” self-restraint. I’m not really one of them. I just end up eating a plate of these irresistible little devils over the span of the evening. But hey, no regrets. St. Patrick’s Day only comes once a year. You should definitely enjoy it! Preheat oven to 325° F and line a 8″ square pan with parchment paper. Slice the vanilla bean and scrape the seed outs. Place the seeds and the pod in a medium sized dutch oven. Add the butter and sugar to the pan and melt over medium heat, stirring frequently. Once sugar has melted, remove vanilla bean pod. Sift cocoa into the butter mixture and stir to combine. Remove pan from heat and let mixture cool a minute or two. Add whiskey and stir to combine. Add the flour and stir just until it is incorporated. Pour brownie batter into prepared pan and bake for 20 -25 minutes or until a toothpick inserted comes out mostly clean. Set brownies to cool on a metal rack. While the brownies are cooling, combine sugar, butter, heavy cream and salt in a small saucepan over medium heat, stirring frequently. Let the mixture boil for 2-3 minutes. Remove from heat and slowly add the white chocolate, stirring until it is completely melted and smooth. Slowly add the Baileys and Irish Whiskey, stirring until combined. Pour the ganache over the warm brownies and spread with a spatula. Allow ganache to harden over an hour or so. If you wish to serve regular brownies, go ahead and slice them and enjoy. If you wish to make smaller brownie bites as I did here, use whatever shaped small cookie cutter to cut the brownies. I used a 1 1/2″ circle cutter. Woohoo! 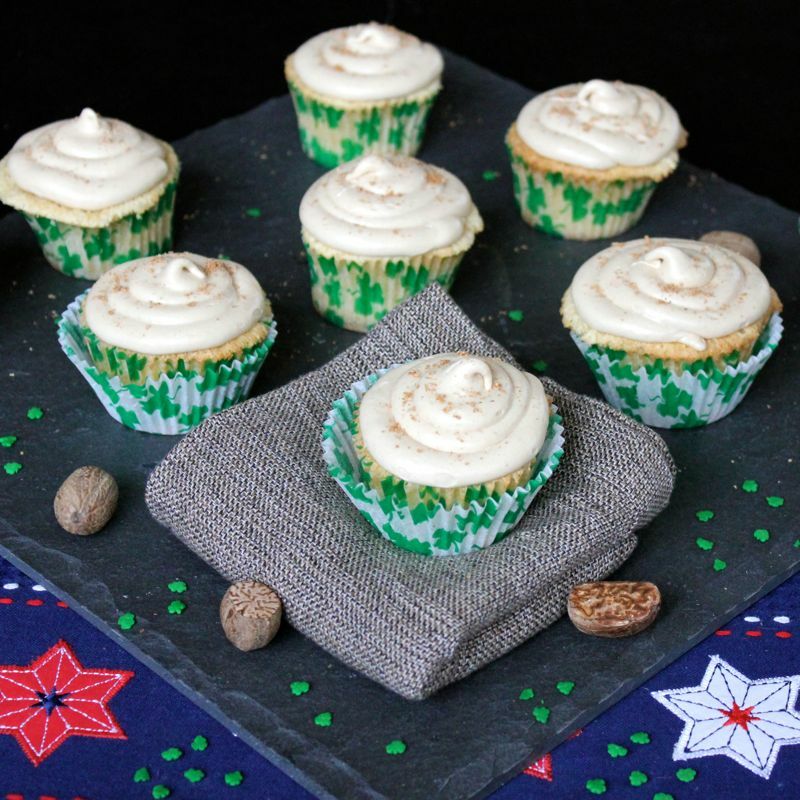 Today’s the day and I’ve got a great St. Patrick’s Day recipe all ready for you…Malted Scáiltín Cupcakes. For those of you who have been following along with me for any time now know that I simply adore cupcakes. 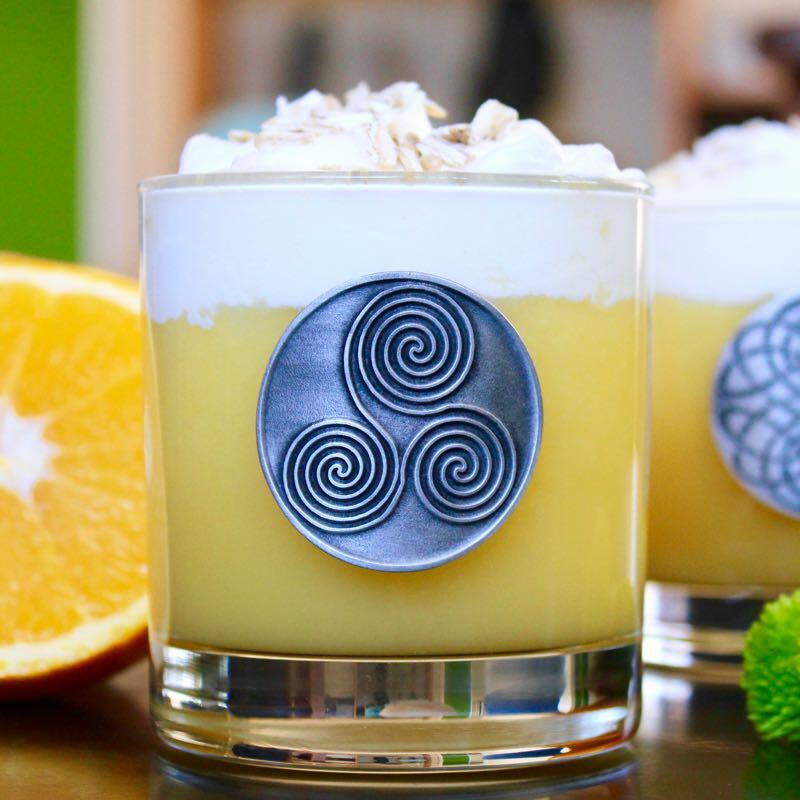 So for St. Patrick’s Day I decided to make a cupcake version of Scáiltín (Irish Milk Punch), which is a drink made with hot milk, Irish whiskey and spices. It has been taking the chill off folks in Ireland since the middle ages. I told you all about it a couple of years ago and if there was ever a winter to inspire one to imbibe a few of these, it was the one we just had and are hopefully now seeing the back of! I adapted a Hot Milk Cake recipe for the cake bit of these cupcakes, seeings how hot milk plays such an important role in Scáiltín and added a bit of Irish Whiskey into the mix. The frosting is a delightful combination of marshmallow creme, butter, whiskey, Baileys and spices. And just as you do with the drink, I have garnished the cupcakes with a bit of freshly ground nutmeg. The result is one fantastic boozy cupcake! The cake is moist and tender, sweet but not too sweet. Oh and that frosting…creamy and addictive I tell you! 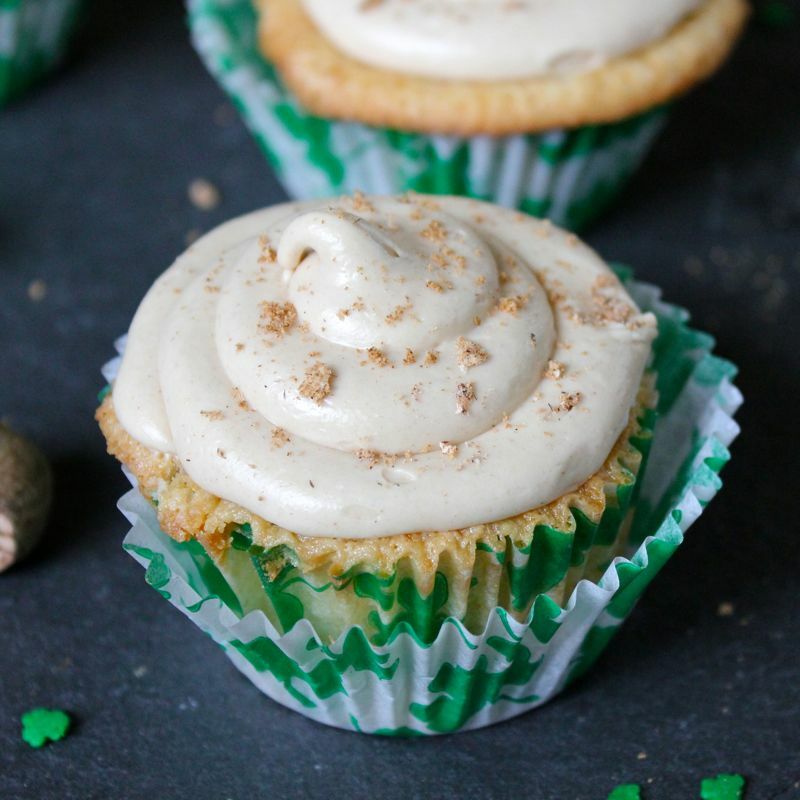 Cupcake perfection for St. Patrick’s Day! Preheat the oven to 325°F. Grease or line two 12 cup muffin tins with cupcake papers. In a large bowl, beat together the eggs and sugar until very thick; the batter should fall from the beaters in a thick ribbon. Beat in the vanilla. While you’re beating the eggs and sugar, heat the milk, butter, Irish Whiskey and honey in a small saucepan to just simmering. Add the hot milk to the egg mixture in a slow, steady stream as you continue beating. In a separate bowl, whisk together the flour, baking powder and salt. Fold the dry ingredients into the wet ingredients, stirring until just combined. Don’t overmix! Fill the cupcake wells using a 1/4 cup ice cream scoop. Bake for 30 minutes. Remove cupcakes from oven and cool completely on wire rack. Cream together the marshmallow creme and butter until smooth and fluffy. Sift the confectioner’s sugar, malted milk powder, salt and cinnamon together. Turn stand mixer on low and add the sugar/malt mixture to the marshmallow by the tablespoon, waiting until sugar is completely incorporated before adding the next tablespoon full. Add the Irish Whiskey and Baileys and mix until smooth. Fill pastry bag with frosting and pipe onto cooled cupcakes. Just prior to serving, garnish with fresh ground nutmeg.